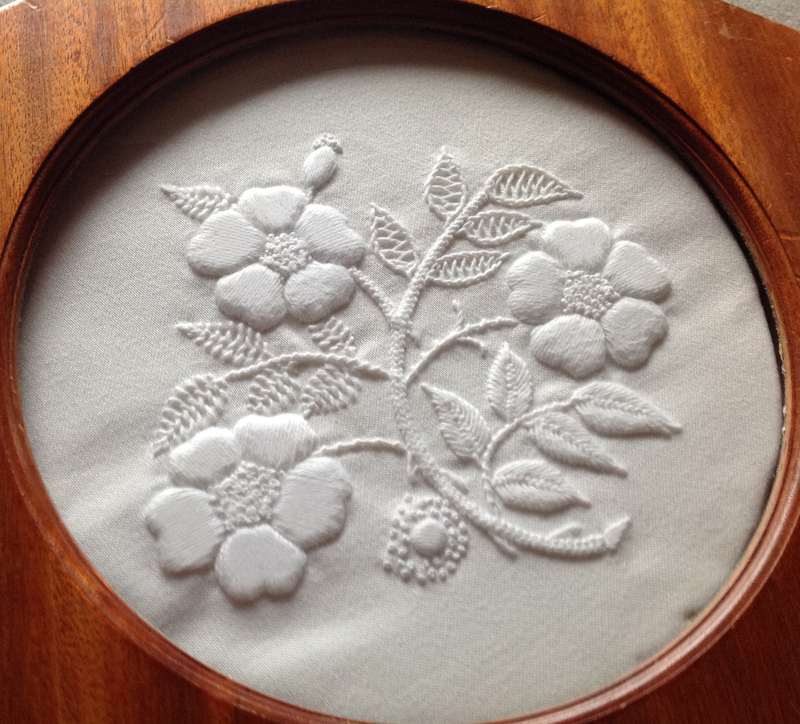 Mountmellick Embroidery takes its name from the Irish Midlands town of Mountmellick, Co Laois where it evolved and was developed in the mid-19th Century. 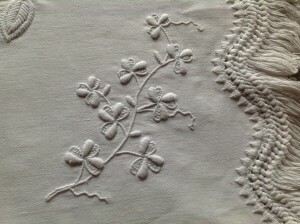 The simple requirements for the embroidery were readily available, these being cotton satin ‘jean’ fabric and matt cotton thread, all in white, and there was a need in the area for female employment. 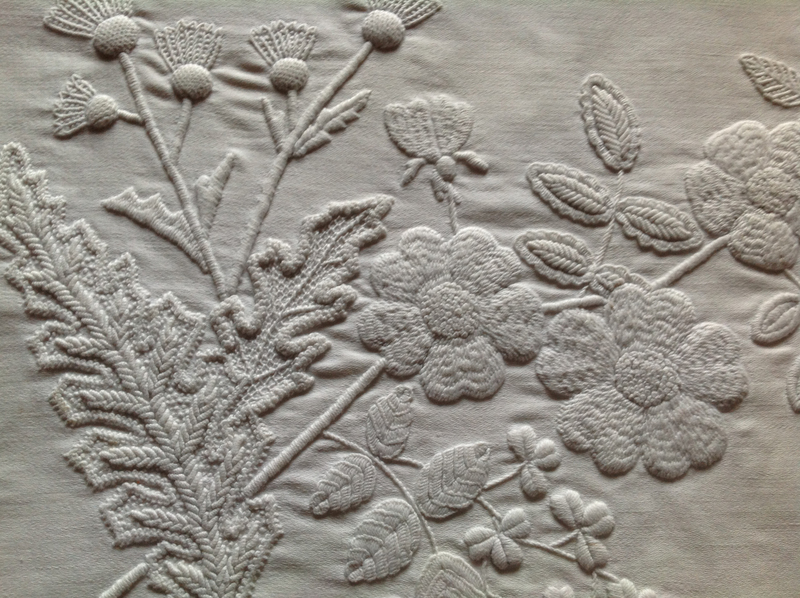 Johanne Carter expanded, literally, the techniques used in the delicate ‘sprigging’ of Ulster and Ayrshire, which in turn were inspired by continental white embroidery. While she apparently had her own workshop in Mountmellick and produced commissioned work, the embroidery style was also taught in the Mountmellick school of the Society of Friends, and thus spread to all parts of Ireland, but particularly the Waterford area. 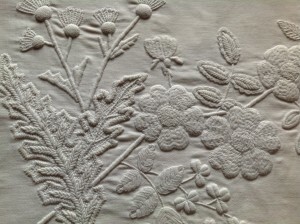 The characteristics of Mountmellick embroidery are richly worked stitching, often padded, in contrast to the smooth cotton ‘jean’, the whole thing set off by the characteristic knitted fringe. 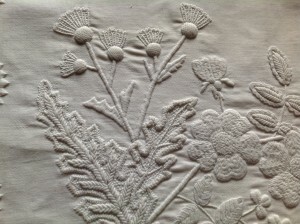 While a total of over forty stitches have been recorded from old pieces, it was most usual to use only ten or so; embroiderers had favourite stitches and executed some better than others, so that the favourite stitch might predominate. As with all other art forms, the success of the finished work was – and is – dependent upon a carefully thought out design, appropriate to the article being worked. 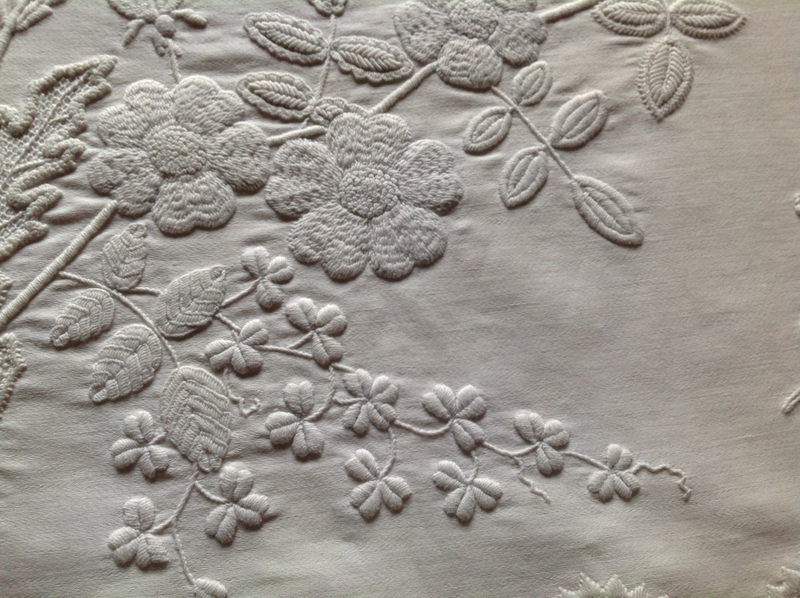 In the 19th century, articles in Mountmellick Work were related primarily to the boudoir – coverlets, pillow-shams, comb and brush bags, and night-dress cases being favourites – and secondly, to the dining room. In Australia, a popular subject was a cloth for the dining-room sideboard, to place under the carving platter and marked ‘Carver’ so that there would be no mistake. 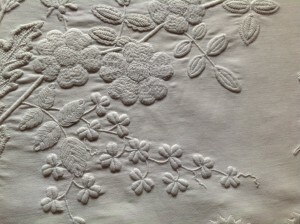 Mountmellick Work has enjoyed a renaissance in Ireland in the last few years and uses have expanded to some articles of cloting – christening robes, collars and camisoles – to wedding requirements – kneelers and ring-pillows. 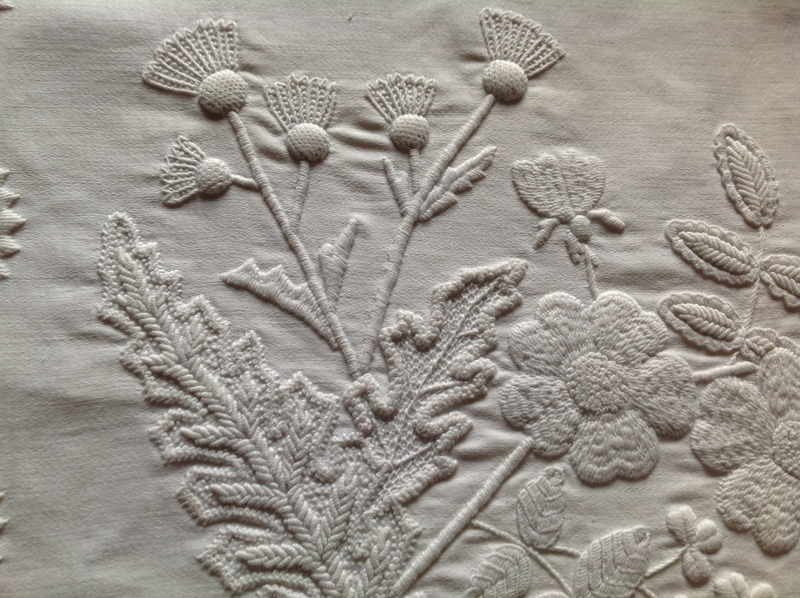 We still have access to the original designs, derived from mainly Irish flora and recently interest has been shown in using original floral design in a more modern way. 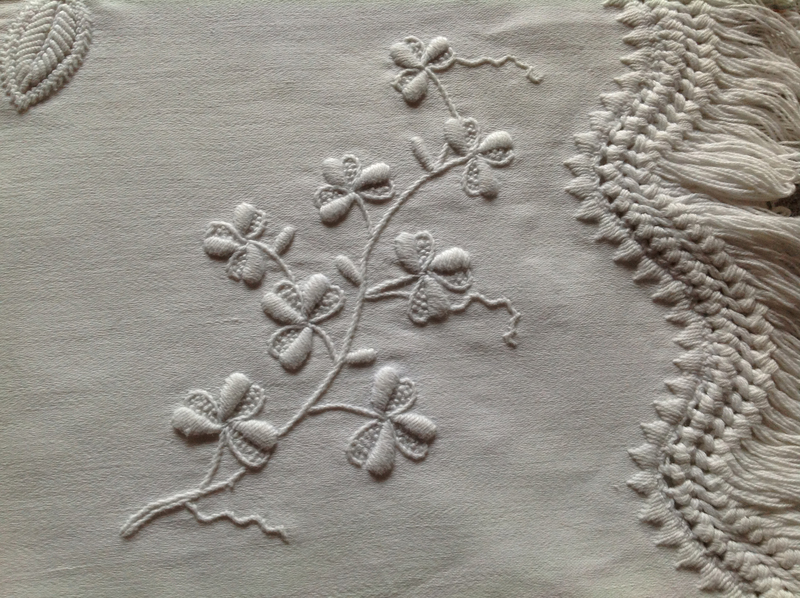 Today’s practitioners of Mountmellick Work find it most absorbing, giving real scope to needle-workers who are fascinated by stitchery.